Panthers' number one Craig Cook collected just five points at the Premier League Riders Championships in Sheffield. There was no joy for Peterborough Panthers’ two representatives in the big Premier League Riders’ Championship last night (September 11). 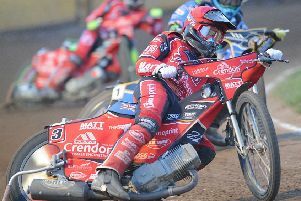 Number one Craig Cook and captain Ulrich Ostergaard both fell short of the latter stages of the individual event at Owlerton Stadium in Sheffield. Cook, one of the pre-meeting favourites for glory, could only manage five points from as many rides while defending champion Ostergaard, who received a late call-up into the meeting, finished on three points with three of his five outings ending in last places. The meeting ended with a home triumph as Sheffield star Simon Stead held off Edinburgh ace Sam Masters for victory in the final. Redcar man David Bellego climbed onto the final step of the podium. QUALIFYING SCORES: Simon Stead 13, Richard Lawson 13, David Bellego 12, Jack Holder 11, Sam Masters 11, Danny King 11, Kyle Howarth 8, Josh Grajczonek 8, Kevin Doolan 6, Steve Worrall 5, Craig Cook 5, Josh Auty 5, Ricky Wells 5, Aaron Summers 4, Ulrich Ostergaard 3, Claus Vissing 1. SEMI-FINAL: Bellego, Masters, King, Holder. FINAL: Stead, Masters, Bellego, Lawson.